Mental retardation from congenital hypothyroidism can be prevented if the problem is diagnosed and treated early. This is one of the reasons that newborn screening tests are so important. The thyroid gland produces hormones that influence many states and functions of the body, including energy, temperature, metabolism, growth, and intelligence. Hypothyroidism is the situation where there are either low levels of thyroid hormones or reasons why the thyroid hormones are not able to carry out their functions. Congenital hypothyroidism occurs around the world, but is fairly uncommon. It is twice as common in girls as in boys. Most of the time this is a hereditary condition, but it can occur from other causes, such as prenatal exposure to radioiodine or other anti-thyroid drugs. Symptoms are usually not noticed in newborns until the lack of effective thyroid hormone has already begun doing lasting damage. This is one of the reasons that newborn screening for hypothyroidism is so important. Often these children have prolonged jaundice. They may be poor eaters, with very little interest in feeding. Constipation is common. They tend to cry very little and sleep a lot. They tend to have large heads, large tongues, and large bellies. Most have umbilical hernias. The soft spots on the head are large and close slowly. Some develop respiratory distress. The temperature, heart rate and blood count are usually below normal. Physical development is slowed, with floppy muscles, late teeth, late milestones, and small size. The hands are typically wide but short. Mental development is also slowed. Unless treated, many would never progress to learn to talk. Some forms of congenital hypothyroidism are temporary. Others are permanent, but can be effectively managed by giving thyroid hormone. Damage done from untreated hypothyroidism may be permanent, even if treatment is begun later. This is another reason that the newborn screening program is so important. 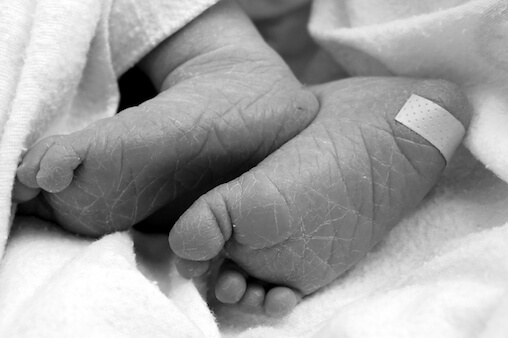 Most congenital hypothyroidism is discovered on newborn screening tests. This is not always the case, however, and typical symptoms can prompt a blood test to diagnose the problem. Hypothyroidism is treated by consistently giving thyroid hormone. Hypothyroidism usually cannot be prevented, but the mental retardation and other complications usually can be prevented by prompt diagnosis and treatment. Hypothyroidism, PKU, and fetal alcohol syndrome are each important causes of preventable mental retardation.